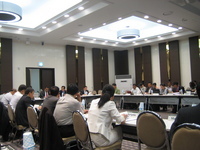 The ADRC attended the ISD R Asia Partnership (IAP) Meeting held from 11 to 13 August 2010 in Incheon, Republic of Korea. The meeting was organized to speed up the preparations for the Fourth Asian Ministerial Conference on Disaster Risk Reduction (AMCDRR) scheduled on 25-28 October 2010 at Songdo ConvensiA in Incheon, Republic of Korea. The main themes, procedures, and expected outcomes of 4th AMCDRR were among the key items discussed and examined at the meeting. The ADRC has been actively involved in drafting outcome documents, and will be chairing Technical Session 1 "Raising awareness and building capacity for disaster risk reduction (DRR) and climate change adaptation (CCA)" at the 4th AMCDRR. In addition, the ADRC has been also co-organizing few side events such as "Incorporation of space-based information to support DRR and CCA" and "Introduction to Recovery Guidance Notes on CCA" with UNOOSA and International Recovery Platform (IRP) respectively. Following the discussions at the preparatory meeting, the ADRC will further strengthen the preparations for Technical Session 1 and side events.